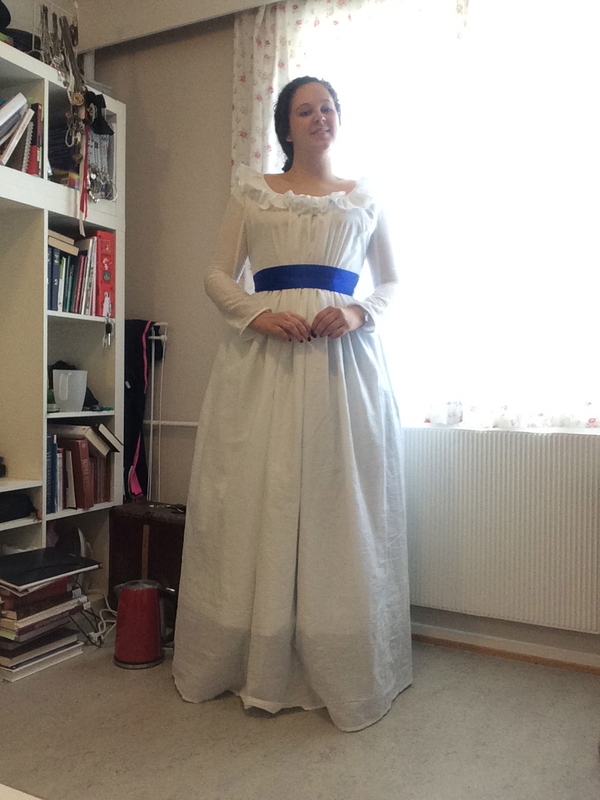 I am done with my Chemise a la Reine! And what a garment this is! The Chemise a la Reine, also known as the Gaulle or the chemise dress, was originally designet by Rose Bertin for no other than Queen Marie Antoinette, and based on the loose, light cotton dresses women wore in the West-Indies. This garment was one of the most scandalous garments in the history of fashion! I mean, look at this! There were, of course, many reasons to judge this new trend rather harshly. Many a Frenchman and woman choked on their congac when they saw the painting of the queen in what looked to them like underwear. “Chemise a la Reine” can perhaps best be translated to “Queenly underwear”. 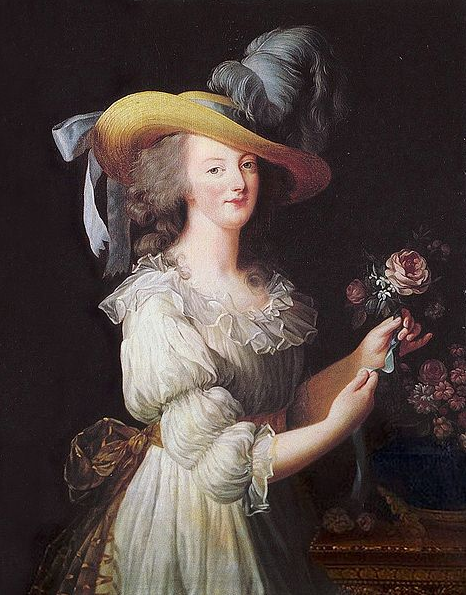 (Portrait of Marie Antoinette, painted by Élisabeth Vigée-Lebrun, 1783). Another reason why this dress, which grew in popularity among young women, was hated by so many, was that it could possibly be worn with no underwear. 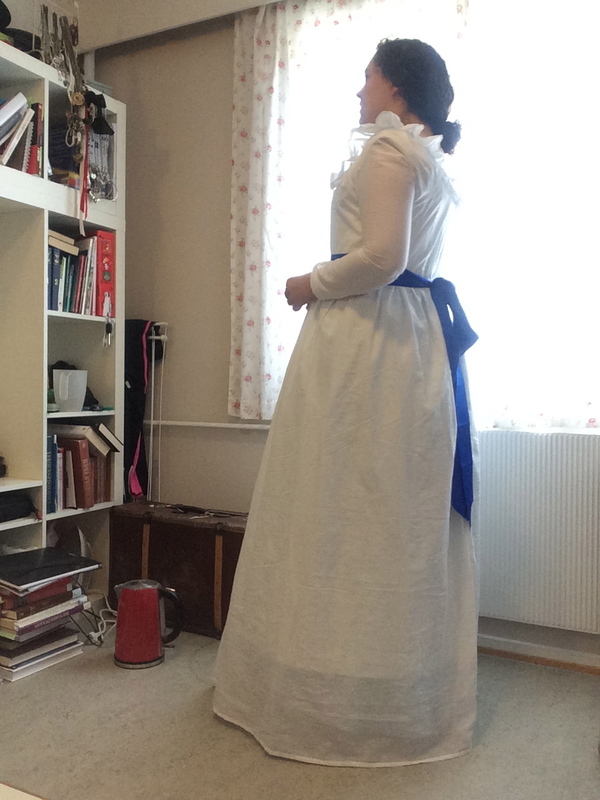 A simple chemise and a thin petticoat was all that was needed, even though most probably wore it with stays too. In England, the dress was disliked because of its French origins, despite popular trendsetters, such as Georgiana, Duchess of Devonshire (of 2008 movie The Duchess and Keira Knightly fame) falling in love with it. 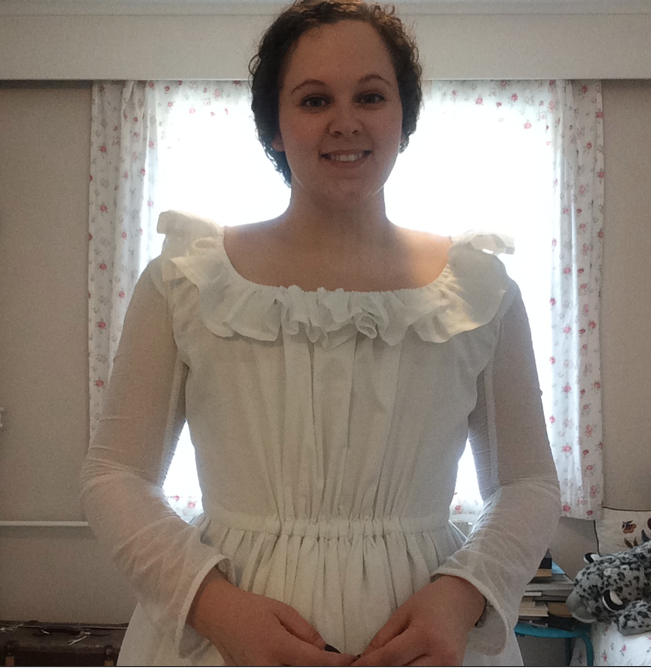 You’d think people were less critical of what young women wear today than they were 230 years ago, but I’m not so certain. Sound familiar? Things don’t change that much, it would seem. Despite the criticism from angry men and prudish ladies, the new fashion became the beginning of something great in European fashion history. 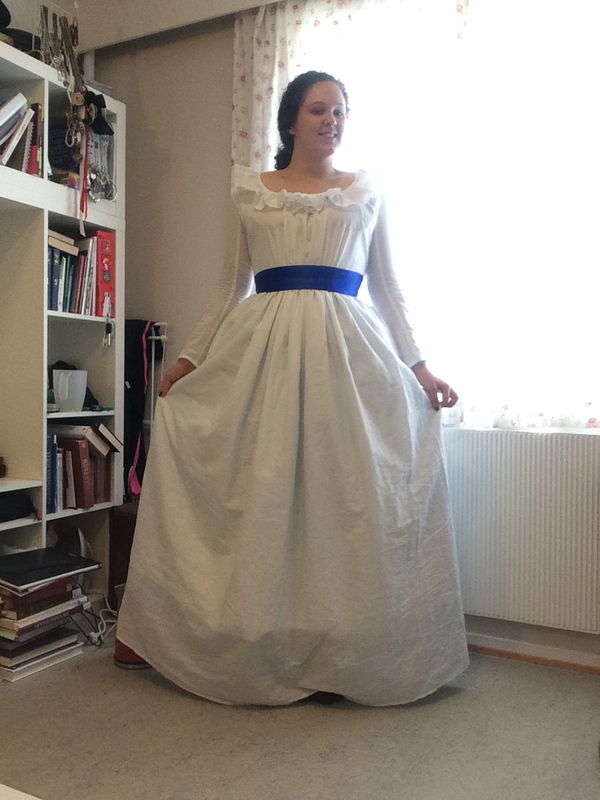 You know the flowing white frocks of Eliza Bennett, Marianne Dashwood, Emma and all the other Austen-heroins? They originated here, with an isolated French queen who dreamt of picturesque rurality and a smart designer who looked further West than Ireland for inspiration. My dress is made from this pattern. 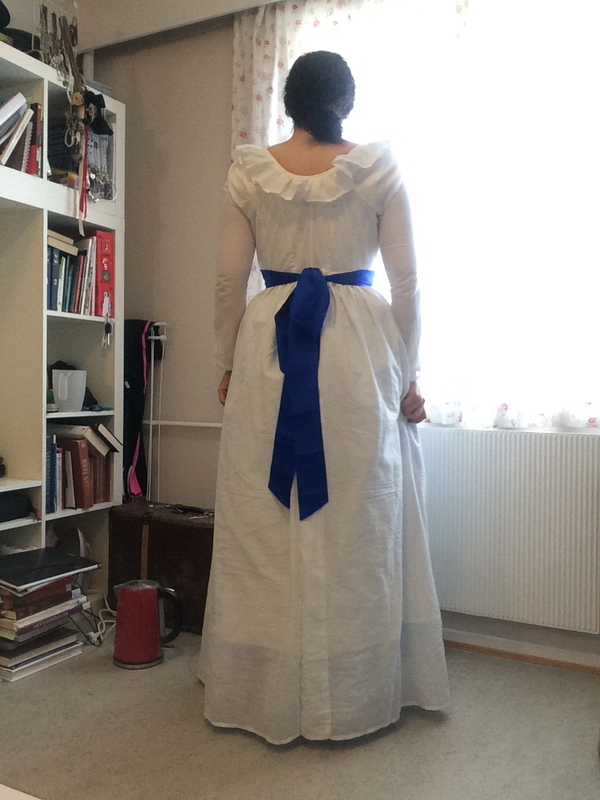 It is handsewn, from thin cotton voile and cotton canvas, tied with satin ribbons around the waist and neckline. 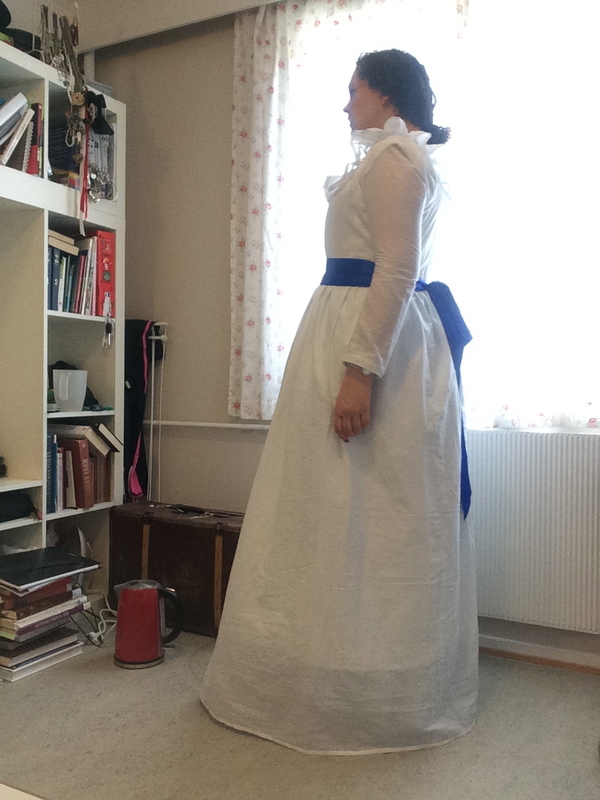 I’ll have to give it a deeper hem, but it is incredibly comfortable, light and airy, perfect for a hot summer’s day! Previous Post THE MOST USEFUL SKIRT PATTERN YOU WILL EVER FIND! Next Post What is indeed up in the hood? Ååå så fin kjole! Well done! (og så ser du veldig fin ut i den og) ! Absolutely fabulous! You look fantastic, and you did a beautiful job! May I share?